Ever saw a youthful looking lady only to have her neck give her age away? In this day and age of cosmetic enhancements, it is easy to soften facial lines, fill up under eye hollows and erase age spots in the blink of an eye. Shaving off a few years from you face is now an easy option for many ladies. But what differentiates them from the naturally youthful ladies lie in areas like the neck. “I can easily tell the age of a woman by looking at her neck or hands” says Gavin K, a makeup artist from Bangkok. “Most ladies focus all their attention on their faces and are not attentive enough to age-related degeneration off face”. Medical experts are in agreement with Gavin with many saying that they are beginning to see more ladies complaining their necks are not living up to the youthfulness of their faces. “In years to come, I see a shift of attention from the face to other parts of the body” says Dr. Michelle Lim Medical Aesthetics Consultant at SW1 Clinic. “Looking good and staying youthful should take on a more holistic approach – it should not just be limited to erasing wrinkles from the face. It should encompass having clear, unblemished skin on the face and body, a toned physique, a sensible body weight and even healthy, shiny hair”. Unfortunately, current trends show that women’s focus tends to be more myopic, with the bulk of aesthetic treatments targeted at problems on the face. Aesthetic doctors that we spoke to claim that as much as 70% of their clientele come for treatments of the face. However, this may be set to change in the coming years as women become more savvy to looking good all round. Here we round up some the top 5 age giveaways of your neck and décolletage. These unsightly muscular bands can be hereditary or they could appear with age. They tend to plague women who are more expressive or use their neck muscles more. They appear when you clench your teeth and can be seen commonly in weight-lifters. The problem is that the neck is one area that you don’t want adorned with muscles. Platysmal bands make your neck look older than it really is. Secondly, these bands pull down on the skin at your jawline and lower face, making them appear more saggy than normal. That’s a double whammy! Treat it: Also nicknamed Nefertiti Lift, after the Egyptian Queen known for her beauty especially her slender, youthful neck, this treatment involves tiny microinjections of botulinum toxin of the neck muscles to smooth out these unsightly bands and give the lower face a lift. This treatment may be termed differently in different countries, though the objective is the same. At SW1 Clinic, doctors tailor different programs which can include botulinum toxin to soften the neck lines, hyaluronic acid fillers to replenish the skin, and Thermage radiofrequency therapy to tighten the neck region. You may not be overweight but you may still develop this unsightly though common problem. It can be due to an accumulation of fat, genetics, sagging skin or a combination of the above factors. Treat it: If you are overweight, then chances are your double chin is due to fat accumulation. The easiest way to get rid of it is to go on a diet and shed some weight. For some people, that does the trick. For others who are not so lucky, more serious aesthetic help is needed. Liposuction can be easily performed on the double chin area to remove the stubborn pockets of fat that plague some people. Vaser liposuction uses ultrasound waves to ‘melt’ the fat before it is being removed; this procedure can also help tighten the overlying skin, killing two ‘chins’ with one stone. If surgery is not for you, consider Ulthera skin lifting. This non-invasive skin tightening treatment uses ultrasound to contract skin and is useful for sculpting the loose skin around the jawline, improving the appearance of double chin and sagging skin. 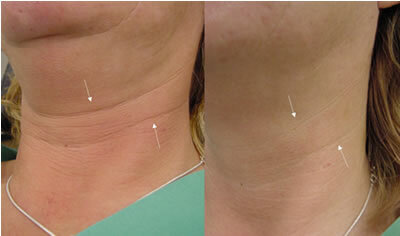 While this treatment may take a few sessions for best results, opt for Infinity Neck Lift, a novel neck threadlift technique using threads to uplift the neck instantly. These threads pack a power punch: they can be fully reabsorbed by the body, stimulating collagen production to anchor the lift for a longer lasting result. These horizontal lines are termed necklace lines because they look like necklace bands etched into the skin. Horizontal neck lines are something that we all have since young but they tend to look deeper and more obvious with age. Treat it: Tiny injections of natural hyaluronic acid fillers along these lines can soften their appearance. 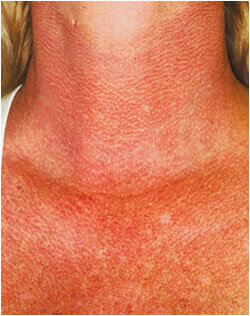 Thermage radiofrequency treatment can also iron out the appearance of these troublesome lines. 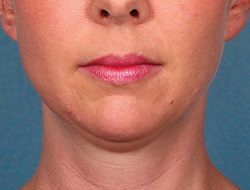 “For horizontal neck lines, I usually perform MicroRefine, which is tiny injections of a soft hyaluronic acid filler in conjunction with Thermage CPT®. Both treatments give synergistic results when done together and in my opinion, is one of the best combination for neck lines” says Dr. Chua Han Boon from SW1 Clinic. Think that only facial skin gets dry? Think again. There are actually less oil glands on the neck, therefore it is an area that is prone to dehydration as well. Unfortunately, not all facial products are suitable on the neck as the neck has “virgin” skin that may not be used to the stronger ingredients used on the face. For instance, if you are using retinoids or AHAs on your face, you will want to use them sparingly on the neck as it may cause redness, flaking or dryness. 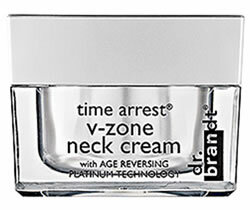 Treat it: Try creams specially formulated for the neck. Use it nightly to restore moisture and prevent age related skin changes. We often lather sunscreen on our faces but stop our UV protection at the jaw line. The skin of our necks and décolletage can be prone to sun damage too. While pigmentation may not be a huge issue on the neck as compared to the face, other signs of UV damage can accumulate over the years. These include loss of skin elasticity, broken capillaries and roughened texture. Treat it: Prevention is still the best treatment in this case. Ensure you extend your sun protection to your neck and chest. Reapply sun protection every four hourly or after you have been in the water. If you have signs of sun damage on the skin of your neck, you can try Intense Pulsed Light treatments to lighten brown and red discolouration of the skin. A more intense skin rejuvenation may be needed for those who have dull, roughened skin. In that case, opt for Fraxel Restore laser, an FDA approved skin renewal laser that will improve not just the pigmentary problems but rejuvenate and renew dull, aged skin. “A series of 4-5 sessions may be necessary but the improvements are long lasting for the patient” says Dr. Chua Han Boon, who regularly performs Fraxel treatments for his patients off-face at SW1 Clinic. SW1 Clinic is one of the largest aesthetic clinics in Singapore offering a wide range of first-class aesthetic face & body treatments, specialising in non-surgical facelift, non-surgical nose jobs and neck threadlifts. It is helmed by Dr Low Chai Ling and Dr Kenneth Lee, who also founded The Sloane Clinic in 2003. Their team of doctors who were also formerly from The Sloane Clinic include Dr Chua Han Boon, Dr Toby Hui, Dr Michelle Lim and plastic surgeon Dr Tan Ying Chien. Neck cream is a must. i sometimes extend my face cream to my neck. Thoughts anyone? Great Idea. I think any cream that help to make face smooth can be use on neck too. you may also be able to forbid the precondition from acquiring worse. Nobody can understand what your saying put it in simpler terms.